December 3, 2014. As Euros and New Yorkers were en route to Miami for Art Basel at the start of this week, the Swiss Institute in SoHo held their annual benefit dinner and auction in their galleries on Wooster Street. 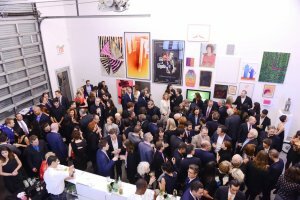 This year’s honorees were the transcontinental gallerist Ursula Hauser, artist Valentin Carron, and cinephilic Renaissance man Matthias Brunner. There was no fondue, but instead an exotische dinner catered by Indochine, a silent auction including works by Jon Rafman, Vitorio Brodman, and Sarah Ortmeyer, and, the main event, a live auction hosted by Simon de Pury, who threw the gavel down on lots contributed by artists including Ugo Rondinone, Ryan Trecartin, and the late Swiss painter Sylvia Sleigh. Despite all the illustrious art-worlders to attend—Paul Schimmel, Annabelle Seldorf, Rashid Johnson, Mary Heilmann, Philip and Shelley Fox Aarons, Bettina Korek, Roni Horn—no-one generated more excitement than surprise plus-one Dr. Ruth Westheimer, the iconic sexpert, who tweeted a selfie posed with Ortmeyer’s Dr. Ruth-sized greyscale ice cream cone.